Right now I am drinking Baileys from a children's Ikea cup..I've never had Baileyss before but apparently it can help cure a sore throat. We all know I have been ill this week so I thought I would try this experiment. As far as I can tell, my throat is still sore but I am starting to feel slightly tipsy.. Note to self: Maybe I should just stick to Lemsips? I feel today's trip to Lakeside shopping centre has made me a tad tired but the Nando's courtesy from my dad, was definitely worth the long trip. After being pushed by an old lady while looking through a clothing rail in River Island, I gave up on looking at the sale items. It's all a little too crazy for me...So I ended up with these lovely non sale items. Aren't they pretty? 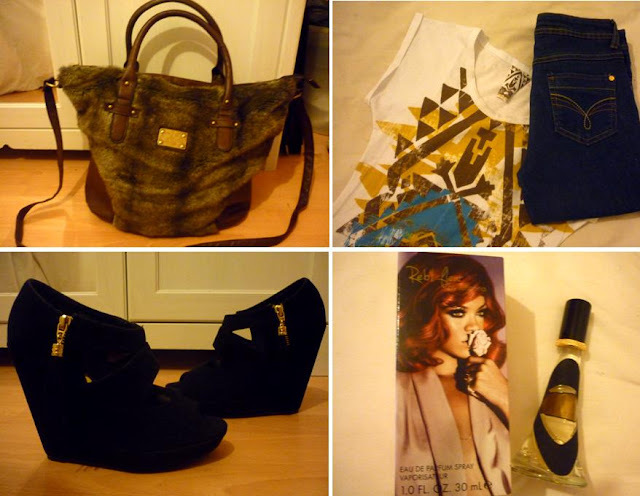 :) As usual, I found myself drawn to buying Primark items, but I'm going to do a Missguided online shop in a bit. The bag was only £9.00 and I love it! My mum and sister thought I bought it from River Island ;) The T-shirt was marked £3.00 but on the till it said £1 - not too shabby. Oh sorry to hear about your sore throat, I've actually heard Hot Toddies are good for it too and I hope the Bailey's helps. The new jeans your want sound great, and I really like those black platforms. Those shoes are amazing!! And I never even knew that Rihanna came out with a perfume, it sounds lovely.